Hi there, friends and fellow card makers ! MY BFF has been hounding me for over a year to get on PINTEREST…well I drug my feet cause I REALLY don’t like being on FACEBOOK…(reason below) but I am on it mainly due to my grandkids refusing to communicate other then to the world on FB….so if I want to even try to find out what they are doing or liking etc I had to get on FB…my daughter too..in fact EASTER SUNDAY we all went out to dinner and we took my mom who would be great gramma and the minute we were seated they all had their phones out and were texting or posting…. like the rest of the world wanted to know ..was just dying to know where we were eating. Ok I’ll get off my soap box and go back to my story about PINTEREST..so I finally got on and WOW…. 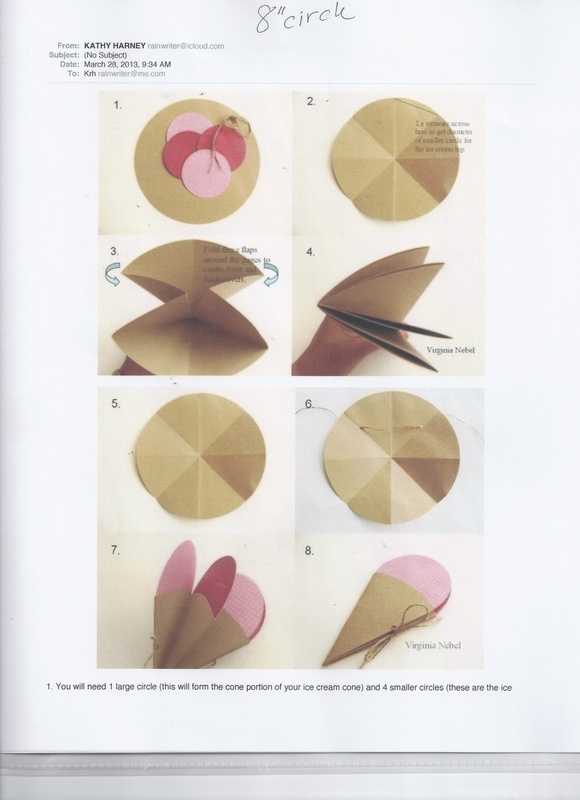 I am blown away with all the stuff I end up looking at… in fact the first night I was up till 3 am ( had no idea of the time) looking at cards, nail art, calligraphy etc… well the good news is I came across this little booklet that you can make which looks like an ICE CREAM CONE…. NOW it was created to be in a scrap book so it was a huge circle and too large in my opinion to be a card…but they were adding photos to the ice cream part so it needed to be bigger… I wrote at the top that I used an 8 ” circle but actually to make my circle punches work for the ice cream I made the circle 7″…. It’s an easy fold and then you can tie it together and if you run the circle thru your embossing machine with some type of over all pattern , herring bone, etc it will look even more like a cone…the way I did it was to fold the cicle in half and run it thru the template that way… if you paper is really thick then it may not work and you may need to try using the foam pad if its too hard to crank. TIP: when embossing or cutting flip the plate over every time so you are not making it warp or at least warping it evenly.. This entry was posted in Cards, Folding/Origami by kath. Bookmark the permalink.